Whenever you try to talk about a classic, you are treading into very treacherous waters. So when I decided to do a write up on a very broadly loved movie such as Psycho, it took some more time then it usually would to get my thoughts sorted out. So, Psycho it is! We all know the story: woman goes to hotel, desk clerk of hotel is somewhat dubious, woman gets killed in the shower, and drama ensues. However, there’s an age gap to discuss, because with a movie being released in 1960, you’re talking about a following of people who were in their twenties when they saw it, perhaps as young as 12, right up until today, with the adults of tomorrow giving this movie a shot. 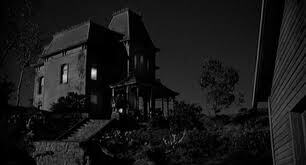 It’s hard to sell a black and white movie to a young crowd, especially with a well known title such as Psycho. I, myself was a bit reluctant to watch it, afraid of the letdown I’d almost inevitably would get from it. But it didn’t let me down, and for a large part, it sparked the passion onto me that I still feel everyday for cinema in general. Hitchcock did an unbelievable job with an original story which was very publicly discarded as being short, un-inspirational and by no means suited for a feature length film. He pursued the actors he wanted, and envisioned it to being a who-dunnit kind of movie. I’ve read (and subsequently heard) his interviews with fellow director Truffaut about his endeavours on this movie. And even Hitchcock himself didn’t think that ‘Psycho’ would have such an impact. He was a master with a camera, and if you plan on watching (or rewatching) Psycho after reading this, pay attention to his way of filming. For instance, when he pans the camera past a suitcase, a big bag of money and a woman looking around with a sense of fear in her eyes. We know what’s going on, Hitchcock is telling us through his viewfinder, and that’s the biggest difference with modern day cinema. Nowadays we get a character explaining to another character, quite often literally, what the plot of the movie is. Hitchcock was a firm believer that the camera should tell the story, not the actors, and when you pay attention to such trivial details you will grow to respect him even more. Whether it’s the single shot in ‘Rear Window’ that literally shows us all the characters, motivations and background stories all without speech or it’s the sudden camera movements near the end of ‘Psycho’, the ominous music or the brilliant performance from Anthony Perkins. We are talking about an artist, who has left us his works of arts. To enjoy, interpret and love for years to come. Therefore, a movie like Psycho doesn’t need to be reviewed, it’s a moving piece of art which needs to be seen by the largest audience possible. Perfection is tough to obtain, sustaining it even harder, and getting an audience to applaude it the hardest. Alfred Hitchcock has done this several times, let’s sit back and enjoy the black and white show of Psycho. Great review, Psycho is one of my favorites. I would think one could learn all they need to about film making by locking themselves in a room an watching Psycho with the sound off over and over.